The center of the Milky Way harbors a supermassive black hole more than four million times the mass of our sun, about 25,000 light-years from Earth. Sagittarius B2 (Sgr B2) is one of the largest clouds of molecular gas in the Milky Way, shown here as the bright orange-red region at left and center (submillimeter-wavelength ATLASGAL data). This composite image includes infrared data (green and blue) from the Midcourse Space Experiment. Astronomers love their sky maps, and this latest is a doozie. It reveals thousands of previously undiscovered knots of cold cosmic dust, each a potential star waiting to be born. The new atlas of dust covers the inner regions of our Milky Way Galaxy, where stars, gas and dust are all packed tightly together, where chaos reigns, where massive stars are born. It's so dusty in there that optical telescopes can't see anything. But cosmic material emits and reflects various forms of radiation besides the visible. The new observations were made in submillimeter-wavelength light, which is between infrared light and radio waves on the electromagnetic spectrum. The data was collected by the European Southern Observatory's (ESO) APEX Telescope Large Area Survey of the Galaxy (ATLASGAL). It is the largest map of cold dust made so far, astronomers said. 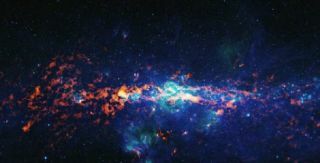 “ATLASGAL gives us a new look at the Milky Way," said Frederic Schuller from the Max Planck Institute for Radio Astronomy, leader of the ATLASGAL team. "Not only will it help us investigate how massive stars form, but it will also give us an overview of the larger-scale structure of our galaxy." The area of the map covers a narrow strip of the galactic plane about two degrees wide (or four times the width of the full moon in our sky). The interstellar medium -- the material between the stars -- is composed of gas and grains of cosmic dust, rather like fine sand or soot. However, the gas is mostly hydrogen and relatively difficult to detect, so astronomers often search for these dense regions by looking for the faint heat glow of the cosmic dust grains. Submillimeter light allows astronomers to see these dust clouds shining, even though they obscure our view of the universe at visible light wavelengths. Accordingly, the ATLASGAL map includes the denser central regions of our galaxy, in the direction of the constellation of Sagittarius -- home to a supermassive black hole -- that are otherwise hidden behind a dark shroud of dust clouds. The newly spotted dust clumps are typically a couple of light-years in size, and have masses of between ten and a few thousand times the mass of our sun, according to a statement released by the astronomers. In addition, ATLASGAL has captured images of beautiful filamentary structures and bubbles in the interstellar medium, blown by exploded stars and the winds of bright stars. The ATLASGAL project is a collaboration between the Max Planck Institute for Radio Astronomy, the Max Planck Institute for Astronomy, ESO, and the University of Chile.